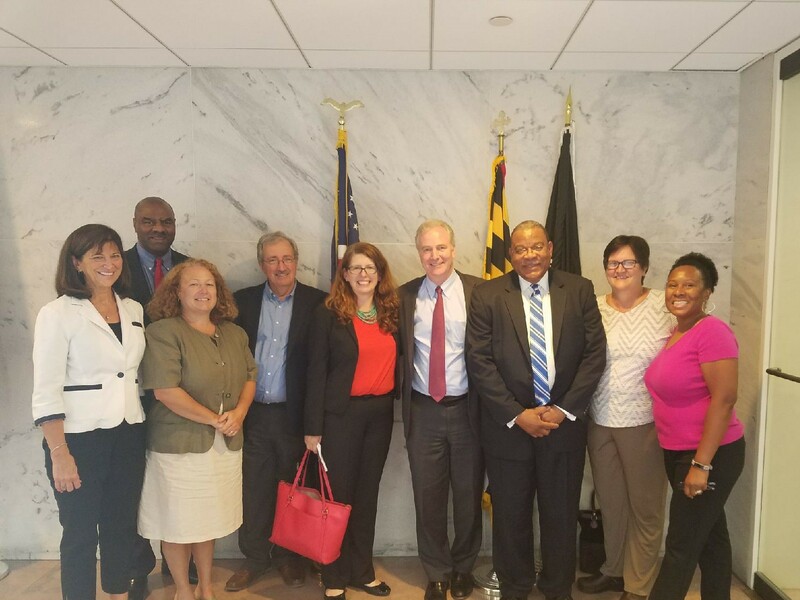 Success Story with Senator Chris Van Hollen - Arundel Community Development Services, Inc.
Wednesday, July 7, 2017. ACDS Executive Director Kathy Koch joined executives from some of Maryland’s largest entitlement jurisdictions, as well as members of the Community Development Network (CDN) and the Maryland Affordable Housing Coalition (MAHC), to meet with Senator Chris Van Hollen on Capitol Hill to discuss funding for Community Development Block Grant, HOME Investment Partnerships, and Community Services Block Grant (CSBG) programs and share success stories from their communities. You can read more about these success stories here. Participants talked about how Maryland receives nearly $70 million in federal funds through the three programs and discussed the negative impacts losing funds would have to our communities. They also discussed how important Low Income Housing Tax Credits, CDFIs and Housing Choice Vouchers are critical tools in leveraging many of these CDBG and HOME success stories. Pictured from left to right: Kathleen Koch, ACDS and MAHC Board Member, Clarence Snuggs, Montgomery County Housing, Charlotte Davis, Rural Maryland Housing Council & CDN Board Member, , Duane Yoder, Garrett County Community Action Agency and CDN Member, Erin Karpewicz, ACDS and CDN Board Chair, Senator Chris Van Hollen, Eric Brown, Pringe George’s County Housing & MAHC Board Member, Julie Day, Baltimore City Housing and Shavaughn Jackson, Diversified Housing Development (Baltimore County, Inc.).